2.15 m of textual and other materials. The records are collected from various sources and were generated in relation to the City of Edmonton's application in 1979 to annex parts of the County of Parkland, Municipal District of Sturgeon, and all of St. Albert. When the application was first made in 1979, the Government of Alberta announced that it would make a final decision after a panel of the Local Authorities Board had completed extensive hearings, resulting in the creation of reports and studies and transcripts of the hearings. In St. Albert, the St. Albert Citizens’ Committee was formed in response to the LAB suggestion that an “umbrella organization” should be formed to convey the viewpoints of individuals sharing similar opinions regarding Edmonton’s Annexation proposal. The St. Albert Citizens' Committee was an ad hoc group of residents of St. Albert who were committed to ensuring that the City of St. Albert would not be amalgamated with the City of Edmonton. This Committee organized various anti-annexation events which resulted in the creation of the photographs and other anti-annexation records. 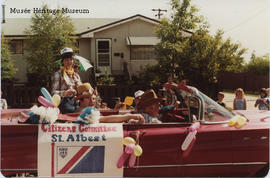 This collection contains records pertaining to the annexation attempt of St. Albert by Edmonton between 1979-1981. Records include photographs and materials from anti-annexation events, Local Authorities Board hearing transcripts, and reports and studies on the proposed annexation. Transferred from the City of St. Albert and other private donations. Related collection items can be found in the collections database Argus.